Kids’ eyes get wide as they picture a character like Paul Bunyan, the giant lumberjack, with his huge blue ox Babe creating the Grand Canyon by merely dragging a logging tool behind them as they moved through the western U.S. These amazing stories may be fun to hear and read but have you ever considered that sometimes you produce tall tales about your relationship, your mate, and even yourself? When you do, the yarns aren’t often enjoyable and they can create huge distances between you and your love. You may not even be aware that you are telling yourself tall tales. You probably don’t come up with Paul Bunyan-like truths about your mate crushing acres of forest just by rolling around in his or her sleep! But when you do make assumptions and hold beliefs that may not be accurate, the effects can be damaging– especially when you are trying to communicate with your partner. Have you ever tried to have a conversation with your love about something that you two see quite differently? Perhaps you believe that your partner doesn’t approve of the way you handle money. You cringe every time the topic of budgets and spending come up because, in your mind, you are sure he or she sees you as irresponsible when it comes to money. This is an example of a tall tale you’ve created. And what tends to happen is when any communication related to money or finances comes up with your love, you immediately go into a defensive mode. And we all know that defensiveness does NOT contribute to connecting communication. Because of the story you’ve spun, you expect your partner to judge you and be disapproving. This may or may not be accurate from your mate’s point of view. You won’t know because you’ve already made that determination through the tall tale. Recognize the whats and the whys. you are on your way to a shift. Get into practice by noticing how you are thinking and feeling when you aren’t in the middle of a triggering situation. Some suggest taking a few deep breaths and checking in with yourself every time you pass a clock or a stop at a street light. Keep tabs on what’s going on for you so that you can more easily notice that what you’re hearing from within is a tall tale. When a story emerges in your mind, ask yourself if you know this to be true and accurate? If you don’t, it might be a tall tale. It’s not necessary to pick apart every aspect of the stories you tell yourself. You could probably analyze them all day! But as you’re looking at a particular tall tale, you might also ask yourself why this tale might have developed. Maybe you feel insecure about your own abilities to manage money and even a bit intimidated by your partner who seems to have a knack for balancing the checkbook and keeping track of finances with seeming ease. abilities is actually about your own fears and perceived money challenges. This realization can help you see what lies behind the tall tale and more easily let it go. Who does my tall tale serve? It’s said that the Paul Bunyan tall tale was actually invented by early 20th century journalists who were trying to promote the logging industry. The stories glorified loggers as strong and fantastical men clearing the way West and enhancing the land as they went. Clearly, tall tales about Paul Bunyan and Babe might be enjoyable for children to hear, but they also served the logging industry. As you discover the tall tales you rely on, question who does the story serve. You may find that your belief that you are irresponsible with money not only hides fears and insecurities about your financial abilities, but it also lets you off the hook. You can put the responsibility completely on your mate when you maintain he or she thinks you are hopeless when it comes to finances anyway. As you learn more by going within, you will probably realize that the tall tales don’t actually benefit you, your love, or your relationship. The more you recognize when you are telling yourself tall tales, get a clearer idea of why you tell this story and that, ultimately, it really doesn’t serve anyone, you can more easily let the tall tale go. 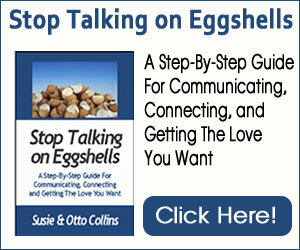 You can then open up to communicating more freely, lovingly and connectingly with your partner. And that is a happy ending for sure!